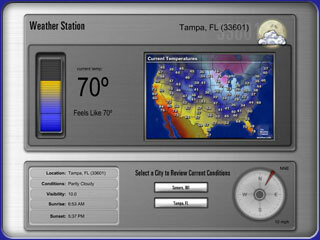 WeatherLobby 3.90 is FREE to all existing Cinemar customers. Weather information is an important part of everyone's daily life. Whether planning a trip to the grocery store or halfway around the world, you want to know what you've got to deal with and what you've got to look forward to. With WeatherLobby, that knowledge becomes power. Power to know how to dress your kids, when to hit the road and when to settle in for a movie and some popcorn. 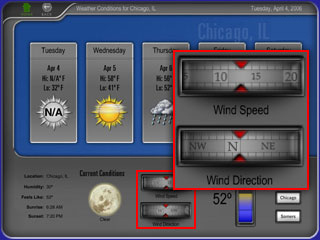 With WeatherLobby, you can finally answer the age-old question "How's the weather down there?" 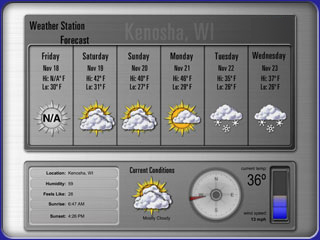 One-click access to weather information and forecasts for up to 10 locations anywhere in the world, so graphically stunning and easy to read - you'll know instantly if Aunt Edna's up to her eyebrows in snow or crisping in the hot sun. and sports scores for the news to tell you if you should be packing a picnic lunch or investing in sandbags to protect your home. If you can't control the weather, you might as well have control over how you see it. New variables to report the above data. Visit our Online Wiki for a complete list of Variables. Includes new GuiGraphix Library 0013 which contains Weather Vanes, Temperature Gauges, Compass, Wind Speed Gauges and much more. 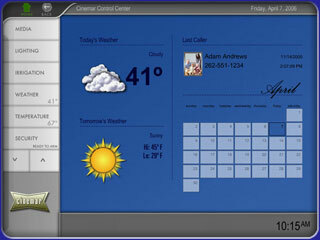 To Download WeatherLobby 3.90, Select HELP > CINEMAR INSTALLATION ASSISTANT from MLServer and search for MLWeatherLobby.